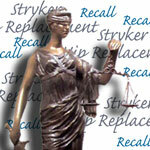 Stryker ABG II Hip Lawsuit – Device Recall and Rejuvenate Claims. On March 26, 2013, a Massachusetts woman filed the first federal Stryker ABG II hip lawsuit to date. The action was brought against Stryker Orthopaedics by plaintiff Lisa Lincoln in the U.S. District Court for the District of Massachusetts. At this time Stryker multidistrict litigation (MDL No. 2441) has only included Stryker Rejuvenate hip lawsuits, and prior to Lincoln’s claim, there were no known ABG II cases pending in district courts. The defendant had just submitted a report to the Judicial Panel on Multidistrict Litigation (JPML) asking that lawsuits involving ABG II implants not be included in the MDL. On July 6, 2012, Stryker issued a voluntary hip recall for its Rejuvenate Modular and ABG II hip implant components. The manufacturer stated, “This voluntary recall was initiated due to the potential risks associated with modular-neck stems. These risks include the potential for fretting and/or corrosion at or about the modular-neck junction, which may result in adverse local tissue reactions manifesting with pain and/or swelling.” Serious complications such as these were alleged by plaintiff Lisa Lincoln, who states that her ABG II system caused metallosis and other issues requiring revision surgery. The Massachusetts claimant was implanted with an ABG II femoral stem component in her right hip in June 2010. By March 2012, she contends that she was suffering chronic pain, and after physician examination was found to have a pseudo-tumor directly behind the acetubular cup. According to her Stryker ABG II hip lawsuit, a second medical opinion concluded that Lincoln had high levels of cobalt in her blood, suggesting metallosis from the metal neck and stem rubbing against each other. Her doctors also discovered significant fluid accumulation around the artificial hip, which showed signs of loosening and early failure. Lincoln states that her surgeon informed her about the Stryker ABG II recall over the phone in January 2013, which prompted her subsequent blood panel tests for cobalt toxicity. Her revision surgery to remove the hip components was scheduled to take place on March 26, 2013. Released through the FDA’s Special 510(k) process in 2008, the Rejuvenate and ABG II modular-neck hip stems were not subject to stringent pre-market testing. Instead, the implants were proven “substantially similar” to other devices already on the market and were used in patients without ample research to test their safety and efficacy. The ABG II has a cobalt neck that fits into a titanium stem, and can be used with a variety of surface components. Like others who’ve filed Stryker Rejuvenate hip lawsuits, the plaintiff is suing on multiple counts including negligence and breach of implied and express warranties. Mrs. Lincoln’s husband also charges loss of consortium. Plaintiffs are also suing Stryker for fraudulent claims that the metal neck and stem components in the ABG II and Rejuvenate were not prone to fretting and corrosion.